It's amazing to me how much Susan Hill can incorporate into each episode of her Simon Serailler series. Yes they are police procedurals and mysteries, but they also provide continuing character studies of the primary, continuing characters as there lives change in many and unexpected ways. And secondary characters are not ciphers but are fully developed with full pasts, presents and hoped-for futures of their own. In this episode, recent brides and newlyweds have been shot by a sniper without warning, with no apparent motive, no apparent rationale for order of attack, and Lafferton and the Police are desperately trying to make sense of this and prevent any further death. Then there are changes within Serailler's family. Hill continues to play by her own rules as she moves forward in this series. No one is truly safe before this author's pen!As for rating,I did have a guess as to the perpetrator but that didn't bother me because of the strength of the other stories and catching up from past episodes. There were some moments in this book that I found profoundly moving and well written, beyond the genre expectations. I waffled between 4 and 5, but landed on 5 for emotional grounds. OK, I understand that when a sort of formula is working you may not want to mess with it, but four books, four serial killers, only one little English cathedral town? Beloved characters: you ought to move. Hill is obviously much more than a competent writer, so I'm confused by the repeat plot. Also, the personal events that befall the main Serailler family are SO SAD, and not in a useful way. I honestly don't understand why some of the hard things that happen to them do in this book--it just seemed overly cruel. What's the message--that life really is this hard? Okay. But still, reading this sequel is a tearful lesson about The Random and Cruel Acts of the World, without much of the nuanced and interesting reflections on faith or belief that infused the other books. I hope the next one (which I will certainly read) brings a little relief. As you can tell by the start & finish dates, this was a consuming & fast read for me. I am so glad I discovered the Simon Serrailler books by Susan Hill a year-and-a-half ago. I ration them, slot them into my reading as treats. The characters are so well-crafted, the Cathedral town feels familiar to me, the plots are full of lovely sleight-of-hand that keeps me guessing & often tempts to go to the end to alleviate the anxiety I feel on behalf of my favorite characters, she makes it hard to stick to my "no peeking" rule. It is always great to read about Simon and his extended family, although there are getting to be fewer of them 4 books in. I think I read somewhere the BBC or ITV is going to film these, I do hope they are well done. Highly recommended, deceptively complex, beautifully told mysteries, give them a try if you like English mysteries. After the more leisurely second and third instalments of this series, this is the tightest book to date. A sniper is targeting young married women in Lafferton; Cat has returned from Australia and faces her most heart-rending challenge; a widow is taking her first steps in dating again; and Jane Fitzroy is finding her direction in life.I guess you could read this novel without the rest of the series but the others really add resonance as people's pasts count here. Definitely don't read this is you're looking for a more typical police/crime novel since the perpetrator is not difficult to spot and, in any case, Hill is always more interested in her characters and the effect crime might have on them than writing a mystery. A true 4* this one.......Susan Hill is back to her best with Gunmen terrorizing women in the Cathedral town of Lafferton. What — if anything — links these apparently random murders? Is the rifle marksman the same person as the killer with the handgun? Simon Serrailler uses well-tried police methods - questions neighbors, searches house-to-house and ponders, both the motives for the murders and his personal life. His sister Cat is back with her family from their six month sojourn in Australia, but tragedy strikes home in her warm and welcoming farmhouse.Another good read. Read this in one sitting except for breaks to hunt down more coffee.Serrailler is dealing with a number of things after the end of the previous book. A killer who shoots young women and a new DS who seems to be an idiot.There's also personal problems which come in threes, including a tragedy close to home.Again Hill presents a group of characters who are more than window dressing for the main character. There are also secondary characters who are new to Lafferton but essential to the story. Looking forward to the next. Susan Hill's Simon Serailler novels are shelved as mysteries in libraries and bookstores, and here on my virtual shelves as well. Having read the first (The Various Haunts of Men) and the fourth (this one), and some reviews, I think they are actually domestic fiction about a family, one of whose members happens to be a policeman.I enjoyed both books, and will probably seek out the middle two and any sequels. But I enjoyed them as domestic fiction more than for the mystery. I learned from some of the other Goodreads reviews that each of the four books has Simon dealing with a serial killer, which stretches credulity given that the series is set in a relatively small cathedral town. I read a lot of police procedurals, and serial killers seem to crop up a lot, partly because in most real-life homicides the police know more or less "whodunnit." The need for proof can make tales of homicides which are domestic, gang-related, or committed during the commission of another felony interesting; but it's still a little more difficult to come up with plausible scenarios for detective work under those circumstances. So, nearly every writer of police procedurals has to have an occasional serial killer to deal with. But I'm just tired of them.In a sense, though, the serial killer is not really the focus of The Vows of Silence. In fact, more people die in the book from accident, suicide and natural causes than by the hand of the killer. Although some chapters put us inside the killer's head, the victims are given equal time and their deaths are described more empathetically than is sometimes the case. Serailler seems to take a long time to come to a solution, but he has a lot of personal concerns to deal with, and in the end, those are the portions of the book I will remember. Recommended, but not as a mystery. This fourth entry into the Simon Serrallier series left me with some rather mixed feelings. After the third book, The Risk of Darkness, ended rather abruptly and despite several characters being abandoned it what felt like mid-story, they are not so much as mentioned here. I also expected there to be more with the kidnapper, but that plot line also has been cast aside. My concern over these plot lines led me to ruin a large part of the book - I thought I would read the synopsis for the fifth book - it should have been label “spoiler alert” because not only did I discover nothing to indicate one way or another that the third book would be revisited, but a huge development of the fourth book was completely given away!Despite my dissatisfaction with the series and its continuity, I did greatly enjoy this book. Emotions run very high here and the plot offers quite a few genuine surprises. Simon, our series main character, continues to develop and is at his most likable here. I am definitely looking forward to the next book in the series, especially if it will be as fast-paced as this one! 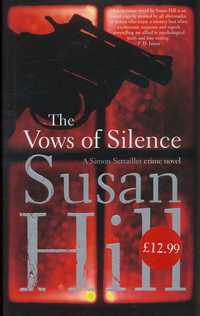 I love Susan' Hill's books, though there is a sameness about them (serial killer terrorizes Lafferton). She's an excellent writer, reminding me of Elizabeth George only less wordy. She employs multiple points of view - including the victims and the killer - but it works very well; you always know who is speaking/thinking/experiencing the story. Her characters are appealing, especially the sleuth (Simon Serrailler) and his sister Cat. She weaves in and out of their family problems, his struggles as a policeman, his romantic entanglements (or avoidance of them). Susan Hill is one author I can depend on - I will always get her latest. I've now read the first four of the series. I like it a lot, but it is strange in some ways. The first book, for instance, hardly featured the protagonist at all; it was mainly about a new employee who was attracted to him. The next three, we have the protagonist, but I don't much like him. He's a cold fish who treats women badly. However, the mysteries are good, and I really like the guy's sister, a doctor. This is a really good series, and I don't have to like the protagonist, as evidenced by my current feelings for Thomas Lynley. Having enjoyed the other books in the Simon Serailler series, I was disappointed in this mystery. For one thing there were far too many deaths, some linked to the detective story, but others in the back story and involving established characters, and I felt that there were too many story lines and none got the attention they deserved. I also didn't like the frequent use of short staccato sentences of one or two words. This can be an effective dramatic device but was overdone here and seemed merely annoying. It took me a long time to listen to this book. I love the writing and the author's style, but I really dislike the main character, whom I find to be a self-absorbed, clueless snothead. So I only listen to a little at a time less I plot to kill him off. This one was especially poignant with his sister Cat going through hell as her husband Chris deals with a brain tumor. I love Simon Serrailler but I needed to see more of him in this book. I know it's Hill's style but there were some side-plots that I simply didn't care about. A number of them in fact. Rather disappointed if I'm honest. Death continues to surround the Serrailler clan, and not just of the crime variety. While Cat Deerbon deals with a shocking development, Simon is on the trail of a sniper in Lafferton (for a quiet village they've sure had their share of crazed criminals lately!) This book was somewhat disappointing, though. I figured out who the sniper probably was pretty quickly and the red herring wasn't very convincing to lead me otherwise. Then, the fate of one of the characters really made no sense at all.The author also seemed to be much more heavily anti-Christian in this installment than previously. Although some of her characters are believers, most of them are either very shallow Christians (Christmas and Easter types) or they are avowed atheists. One of the few strong believers she's introduced was made into a parody of extremism. I really enjoy this series of books and agree with another reviewer who said its more like a family saga with a policeman as part of the family. One thing I would love to see is Simon finding the right woman. He falls for every unattached female who comes along and I am not sure what Jane sees in him or he in her. She is such an uninteresting person. No idea of what she is doing or what she wants, not suitable for Simon at all. I would love to see him meet his match. He needs a smart, strong woman who can teach him not to take himself so seriously. Come on, Susan Hill, create a challenge for him. Finished this book yesterday. Hill does a solid job of keeping the reader guessing. The ending was somewhat surprising (although I have to admit that the identity of the actual culprit did cross my mind for a fleeting minute before getting to the end of the book). As usual, Hill is so very adept at character development. You know you're fully invested in the story when you laugh out loud or cry at something you've read, the latter of which was true in my case. A solid mystery, sad in parts, but classic Hill all the way around. Like the rest of the Susan Hill mysteries, this very well written and keeps you turning the pages. However, most of the book is about DCS Serailler's family, and the mystery in this case feels like an after-thought. Not much mystery to this mystery, and while the family stuff is OK, that's really not why I read these. I like a puzzle, and this was not much of one. This series is getting weaker for me as she spends more time on his personal life and less on police procedure with each book. An okay thriller covering a serial killer out to kill women after being rebuffed. The author spends more time on the family lives of a set of characters then she does on the crimes themselves. While Kate Atkins on does the same it does not seem as random and contrived as it does here. In this book it seems like there are three to four all rather incomplete stories being rolled out at once. This effect could be because I have only read the fourth of the series. Overall it was a meh. Very, very disappointing. The previous Simon Serrailler books have been quite readable but this one is a disaster. Family tragedy after family tragedy - the poorly written chapters about the serial killer were almost a welcome relief. At this point I don't know if I will bother with the next book in this series. Another great read from Susan Hill. I am perplexed by the 'blurb' on Amazon, which bears absolutely no resemblance to this story however. But, this is a lovely, intricate story. Complex characters and Simon Serailler as good (and intriguing) as usual. A tragic story, which reduced me to tears at times, but still beautifully written. I still LOVE this series, but our Simon was a little slow to catch the connection here. Plus, could anything more happen to the poor Serraillers? And don't EVER move to Lafferton - chances are high you'll not make it out alive. Best yet of the series for me. Really steamed along and I love the development of the family story alongside, with the characterisations there. Though it has to be said that the Serraillers are a fairly unfortunate bunch with what life doles out to them. I didn't like it as much as the other Serrailler books. I very early sussed 'who dun it' and some aspects were too close to home at the moment to make it enjoyable reading. Still, I will try the next one on the list. Hill is not afraid to kill off any character or reveal any character's dark side. I wasn't even close in guessing this one. Ah joy! Fortunately, I have #5 right here. A gunman is terrorizing women in a cathedral town called Lafferton. He seems to be focusing on women soon-to-be or recently married. Simon Serrailler is the coppa investigating the murders whilst also dealing with a family tragedy and a re-emergence of a lost love. Can he solve the crime before more women die?I’m not particularly good at guessing during a whodunnit, but I figured out the murderer really early on. I was genuinely disappointed - I thought the novel was being deliberately misleading so I would have a ‘whoa! No way! Now I must go back and analyse everything I read before!’ moment. It wasn’t.The book follows a very well-trod path of including short passages from the viewpoint of the killer. In many ways, he was a cliche. There was lots of heavy-handed character development - he hates women! He has been rejected! He is obsessive! All of this is typical of the genre, there was nothing new and nothing subtle in its telling.There are a lot of characters to keep up with in this book, who all seemed to be going through some kind of loss. I really could not remember who was who, and some characters seemed almost pointless - they didn’t advance the plot forward or add depth to the main characters. Some of their resolutions also seemed completely at odds with the rest of the book. The character called Helen and her son Tom’s arc felt like it had dropped in from a different book. I could not understand the purpose of it.I’ve read two of Susan Hill’s books, both of which I enjoyed immensely. She is a great suspense writer. But I do not plan read any of the other books in this series. I do, however, want to know what a Jug Fair is, because a huge part of the book revolves around one and I still don’t know. The Simon Serrallier books are reliably good mysteries. Hill always weaves together multiple storylines, including Simon's family's life, his personal life, a police case, and stories about other people who are closely or loosely related to any of the above. Hill could easily write books that are twice as long with this material, but chooses to keep her mysteries short, which makes for a degree of complexity but not a lot of depth. Fortunately this is a series, so the plotlines more closely related to Simon himself can continue from book to book. In this book Simon's father starts a relationship with a new woman, Judith, whom Simon intensely resents for seeming to replace his beloved mother. Simon's sister Cat experiences personal tragedy. Meanwhile a gunman is killing young women who seem to be utterly unconnected to one another, a middle-aged woman tries internet dating, one of Cat's patients takes a turn for the worse, and a female priest tries to find peace in her new job.Although I've read the books completely out of order, this is a series where it does make sense to stick to the order in which they were written. Another superb crime novel in the Simon Serrailler series. Not only do you get a great crime story with these books but also excellent back stories about the main characters. Now a DCS, Simon is faced with the hunt for a killer who is murdering young women who are either recently married or shortly to be married. With few leads and against a background of tragedy and upset in his own family, Simon struggles to work out the killer's motive. The reader gets more clues than the police do as we are treated to some of the murderer's views and feelings - which meant I worked out who the culprit was before they did! Still a gripping read and looking forward to reading further books in the series - 9/10. Loved it! I am enjoying the Simon Serrailler mysteries though I don't find him appealing. In the last book in the series, Simon's physician sister Cat, her doctor husband Chris, and their 3 kids Sam, Hannah, and Felix went off to Australia where Cat and Simon's triplet brother Ivo lives and works as a flying doctor. Ivo is as icy cold as their dad, retired doctor Richard, and they only went because Chris wanted to so badly despite Cat hating Australia and not wanting to go. Simon and Cat's long suffering mother Merial had died after bumping off their handicapped sister Martha.Now Chris and Cat are back with the kids, much to Simon's delight but Chris has been hiding the fact that he has a severe brain tumor from Cat all this time. How one could hide the effects from a severe brain tumor from another doctor, I don't know. He should have told her immediately and started treatment but no, he waits,lets it get worse, then lets one of the children find him twitching on the bathroom floor. He even wants Cat to kill him. While Simon is devastated about Chris, he is also upset that his dad has a new honey, Judith. I know from having read a later book that he will marry Judith and abuse her so I cringe about sweet Judith being involved with him. Cat is fine with Dad's new lady but upset that her friend Karin, the one from previous books who had breast cancer and insisted on treating it not with surgery, chemo, and radiation but with "alternative" therapies like visualization, meditation and herbal tea is in the hospice dying. Obviously the new age stuff can't battle cancer. Karin wants to see the female priest who Simon had hit on during her brief time in town before she dies. Jane has been lying low at a cloistered nunnery (?!) though she is not Catholic but she decides to come back to Lafferton.In the meanwhile, some nut is out bumping off new brides and accidentally killing others too including a 5 year old bridesmaid. Simon will be surprised to find the answer to this crime literally right in his backdoor. In fact, he wonders if HE might not become a killer since he is a loner who is often cold and unfeeling and selfish.There is a storyline here about a widow named Helen who has two kids- Lizzie is getting ready to go off to college at Cambridge while Tom is a young adult who has become a religious fanatic. Lizzie worries that her mother will be lonely when she and Tom move on so she urges her mother, widowed for 6 years, to start dating. Helen very hesitantly decides to try to meet someone on a dating website and fills out the forms. The very first man suggested is Phil, a widower with 2 grown sons, who teaches history at a boy's school and she finally forces herself on a date with him only to be very pleasantly surprised that she likes him and they grow close. Lizzie is delighted but Tom is not. At age 16, the impressionable boy had gone to a week-long camp a friend invited him to and became a religious nut. He finds out that Phil is an Atheist who is very able to tear down belief in Christian mythology in an eloquent and educated manner and Tom is angry that his mother wants to marry the man. To keep his mother from this, he decides to take very drastic matters and I mean drastic! Do read this to find out what he does.This is not your typical English murder mystery series. It is family drama somewhat like a high class soap opera with the typical hospital/police presence. I am ticked off at Cat though I like the character. She believes in Christian mythology. Chris was an Atheist and had always said he did NOT want any church or christian funeral. Of course she has one which is so disrespectful to the man. Atheists do not want Christian funerals in cathedrals and one would think a woman married to a man for 14 years would want to honor and respect him properly with the humanist funeral he wanted. These books really appeal to me, they reach me on several levels. I brood and worry with Cat about her patients and her kids. I want to go into the hospice in Lafferton and comfort the dying and their families. I want to be a mother figure to the wayward kids. I want to get together with Cat and figure out why Simon (and Ivo and their dad Richard) are so cold most of the time and emotionally unavailable and yet seem to hunger for love and family at others. There is something comforting about Cat and there are some interesting people here, all in 3-D and not stock characters nor the often cookie cutter characters that people novels for convenience. Susan Hill isn't writing mysteries- she is writing stories. There is a wholeness here that you don't see in most novels labelled mysteries where the entire focus is on the mystery and solving it. Instead, you become a resident of the imaginary English town of Lafferton and feel like these are your neighbors- people you know. Many people in the stories have nothing to do with the mysteries or crime solving and this is what gives the books a completeness along with the fact that loose ends are never tied in the end and crimes might not get solved till the next book or the next. So what will happen in the next book? How will Cat deal with being single mom to 3 young kids while working as a doctor full time? Will Simon pursue the female priest? Will Simon and Cat's dad marry Judith and start making her life a miserable hell? Who will get murdered next and how will they be done in? Stay tuned for the next exciting segment of Simon Serrailler. Number 4 in the Simon Serallier series, and Susan Hill's writing remains strong. The police work in this book is about a gunman or men who are randomly shooting young women, often in crowds and sometimes brides. There is also tragedy in the Serailler family. All of this is set in the mostly quiet cathedral town of Lafferton, England. It is interesting to follow the family's and Simon's stories, intertwined with the mystery. Read this while recovering from major surgery, and it was right.